The Office of Problem-Solving Courts (OPSC) for the Administrative Office of the Courts is responsible for assisting Maryland’s problem-solving courts in development, maintenance, and advancement of a collaborative therapeutic system. 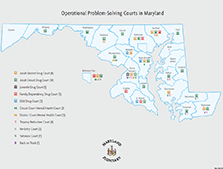 OPSC has overseen the creation of problem-solving programs in 21 of the 24 jurisdictions in Maryland and works with public and private stakeholders to develop and establish best practices in problem-solving courts. The OPSC superintends the financial support for problem-solving courts and is responsible for setting and enforcing programmatic guidelines, creating a statewide management information system, and targeting new and expanding populations for problem-solving courts. Working with the Judiciary’s justice partners, the OPSC continues to serve as the court’s liaison to sustain and advance problem-solving courts in Maryland.